Entering a cathedral of primordial nature, silent but for the noise visitors bring, there is no way to be prepared for the majesty of the tallest trees on earth. The massive presence of these skyscrapers, mists swirling around them, create a sense of wonder and serenity found few other places in the world. With an average lifespan of 500-700 years and as long as 2,000 years, these sentinels have been watching over the land for centuries. While it's easy to keep eyes pointed upward, it’s worth giving your neck a break to scope out the diversity of wildlife. It's easy to observe one of the most famous natives of the park slithering through the foliage: a large, bright-yellow, shell-less mollusk, the banana slug. The park brings refuge for a wide range of threatened and endangered species including several varieties of fish, birds, plants, and marine mammals. Offering a range of activities from deep forest hikes, biking, horseback riding, kayaking, and beachcombing - there is something here for everyone. Even Hollywood can’t get enough of this unusual park. It has been used as a location in several major motion pictures including E.T., Lost World: Jurassic Park, Outbreak, and perhaps most famously, as the Forest Moon of Endor in Star Wars Episode VI: Return of the Jedi. Officially known as the Redwood National and State Parks (RNSP), this site in Northern California just below the Oregon border is a unique partnership between California and the US government. In an effort to save the remaining redwoods from over-logging (rampant in the early twentieth century) both bought land for preservation. Due to their proximity and common mission, in 1994 the management and operations were combined. The parks were originally dedicated in 1968 with several expansions over the years to its current 131,983 acres. In 1980 it was designated as a UNESCO World heritage site. The iconic ‘Avenue of the Giants’ drive along a 31-mile section of old Highway 101 through the Humboldt Redwoods State Park is by far the most popular way to see the most outstanding displays of the leafy giants. The four-mile side trip down Mattole Road is a highly recommended detour. 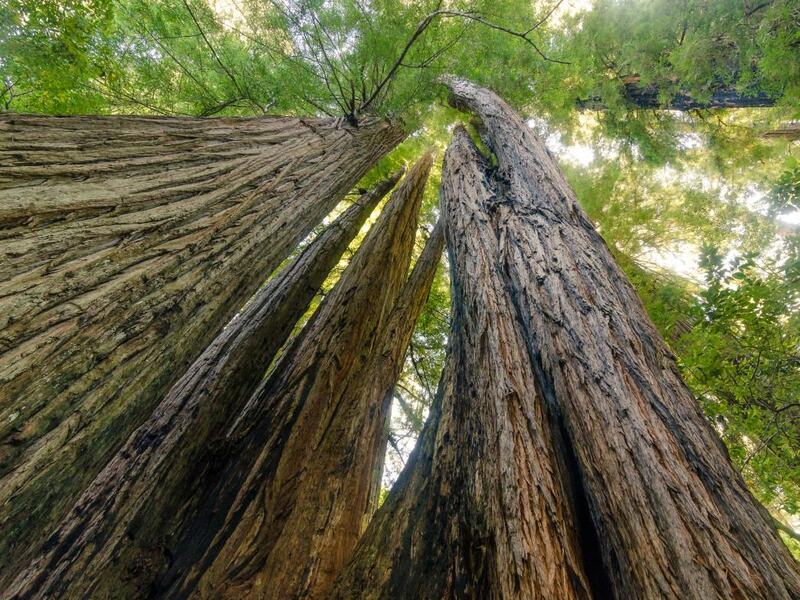 It’s a narrow, bumpy, paved road through some of the tallest redwoods that leads to short walks in the Rockefeller Grove and the Big Tree Are a.
It’s easy get boots on a trail for any level of trekker thanks to 200 miles of trails across the four parks that make up the Redwood area. 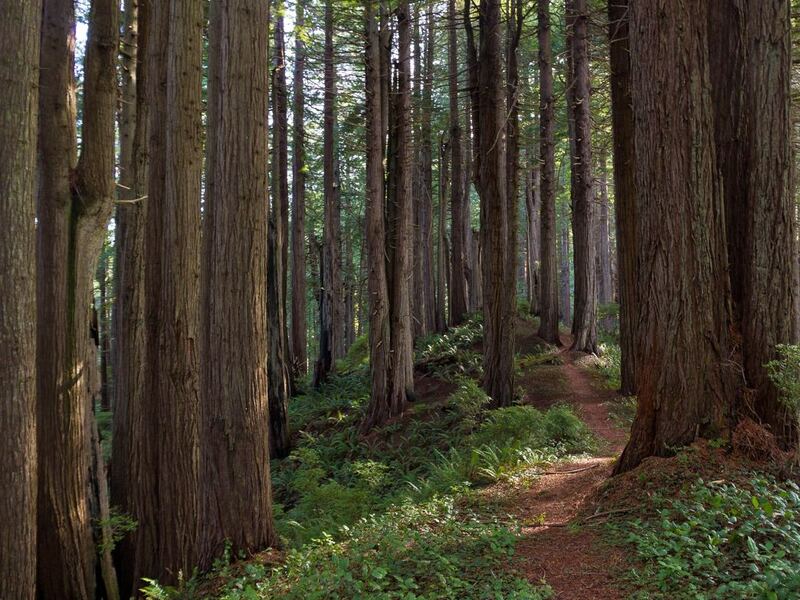 The most popular trail in Redwood National Park is the Lady Bird Johnson Nature Trail. Often recommended due to its proximity to the Kuchel Visitor Center, this 1.4 mile loop leads through an attractive ridgetop grove of large redwoods and is perfect for all ranges of fitness. Jedediah Smith State Park (located within Redwood National Park) has some of the most scenic stretches of redwood forest and some say that the drive up Howland Hill Road to access the trailhead is worth the effort alone. One of the most family-friendly ways to explore these old-growth monsters is the Stout Grove trail which offers a 1-mile wheelchair accessible loop and includes one of the largest redwoods, Stout Tree, at 340 feet tall and 16 feet in diameter. If up for a longer hike, the five mile Boy Scout Tree Trail is a serene choice ending in a small trickling waterfall and featuring a collection of some of the largest redwoods. The trail is named for two trees that have joined in one massive trunk as though giving the two-finger Boy Scout salute. Known as one the best hikes on the West Coast, the James Irvine-Miner’s Ridge Loop is a 13-mile journey weaving through a trifecta of northern California’s most dramatic assets: old-growth forest, Fern Canyon (which can also be done as its own short and spectacular hike), and Gold Bluffs Beach. What really makes this special is the way it traverses a variety of environments, passing from a redwood-lined ridgetop to a wide-open undeveloped beach and finally through a lush creek valley. Explorers should check out the seven mile Berry Glen footpath, the first new trail in Redwood National Park in a decade. 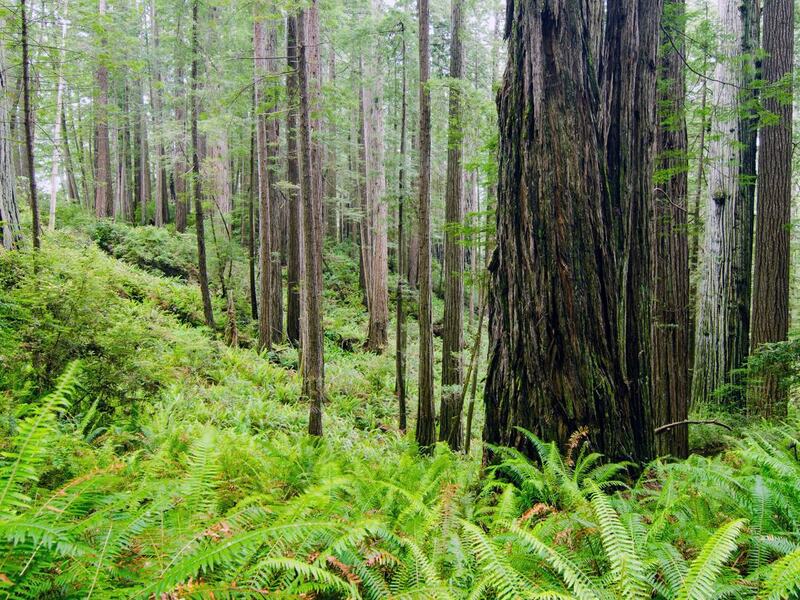 Starting in Prairie Creek in Redwood State Park, this strenuous trail has 1,270 feet of climbing and offers exceptional views of old growth forest. Starting from Elk Meadow, the trail is uphill from where it crosses Highway 101 and includes steep switchbacks until it ends in the Lady Bird Johnson Grove. Two areas have developed pack animal trails in the park. The northern trails near Crescent City, Ca. and the southern trails near Orick, California. Overnight trips are possible at the three pack animal camps. The McArthur Creek Loop is considered the best of the Orick Horse Trails. It’s 14 miles of peaceful, mostly non-redwood forest. Dreams of galloping down the beach on a trusty steed can be fulfilled on Crescent, Gold Bluff, Hidden, and Freshwater beaches. There are also several highly rated area guide companies that offer paid tours. Gray whale spotting is a popular pastime during the peak migration months in November/December and March/April. It’s possible to see the resident population any time of the year at the Klamath River Overlook. Other good viewing spots include: Crescent Beach Overlook, High Bluff Overlook, and Gold Bluffs Beach. 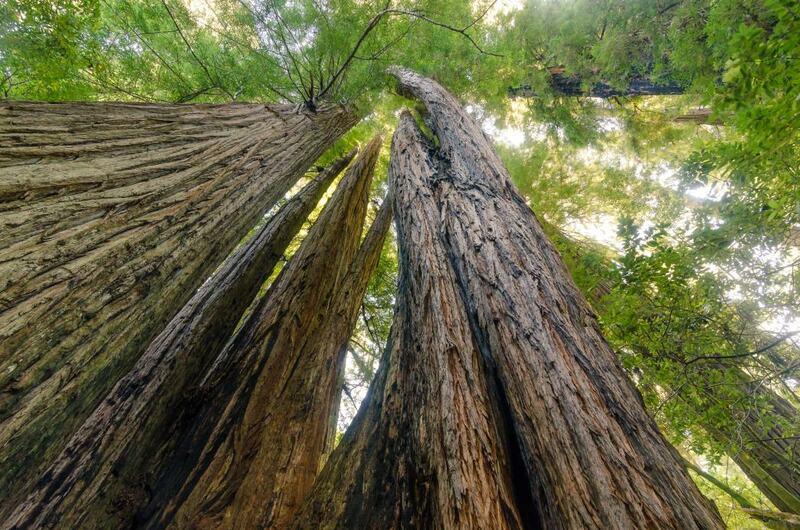 The biggest secret at Redwood National Park is the location of the world's tallest tree. Discovered in 2006 ‘Hyperion,’ is a colossal redwood rising 379 feet, over six stories taller than the Statue of Liberty . The tree lies ‘somewhere’ in the national park on a steep slope. The root system is very fragile and could be damaged by being trampled by visitors, so the exact location is known only to a few. 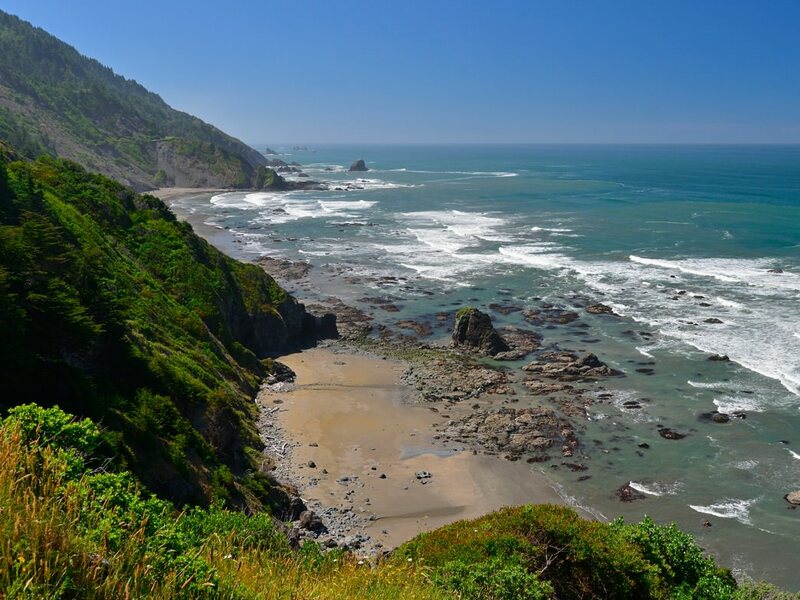 For beach lovers there a relatively unknown, must-visit site in the Del Norte Coast Redwoods State Park. There is no specific name or location marking, but approximately 12 miles south of Crescent City, is a stunning, rocky beach with a primeval feel. Set the odometer just outside of town and start looking for a pull-off after about 10 miles. The sublime ‘Tall Trees Grove’ offers a chance to get deep into the Redwoods and the opportunity to see one of the few behemoths whose location is well-known: the Libbey Tree — once rated the tallest. It's a strenuous round trip trail and features magnificent, monster redwoods in a small grove along the bubbling Redwood Creek. The trailhead is at the end of the gated Tall Trees access road off of Bald Hills Road, accessible via mandatory free permit. The 8-mile, one-way hike is best accessed during the summer months and backcountry camping is allowed on the gravel bars along Redwood Creek. Rhododendrons blooming are another classic feature in the the park and mid-May to early-June is usually the best time to see these lovely native flowers. There are three privately owned attractions that offer motorists the opportunity to drive through a living redwood tree and all are right off US Highway 101. The presence of black bears, mountain lions, ticks, and poison oak should be accounted for when planning for camping and backcountry safety. Also, Roosevelt Elk may be used to having humans around, but during rut and calving seasons they can be dangerous.